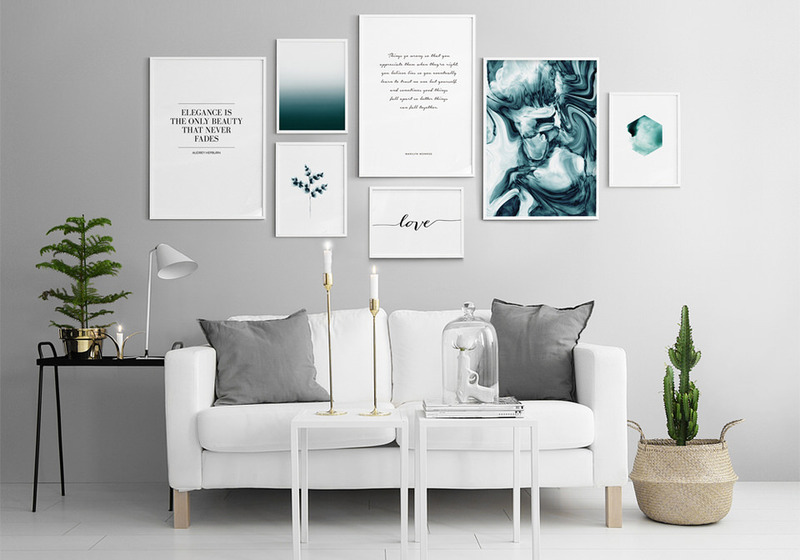 I have a massive crush on this gallery wall and generally speaking, I think when you mix family photos and posters, a gallery wall can look really striking and incredibly gorgeous in your home. However, if you feel intimated to put one together on your wall, let alone nailing or drilling a few nails correctly into a wall, here are some valuable tips to do it right. I have pinned a few examples on Pinterest and put a few examples of small, medium and large gallery walls with posters (see more options here). I also recommend you frame your art and photos in picture frames first, this will help you to put together a beautiful composition. The best way to visualise and try things out is by laying out all your framed pictures on the floor. Start with a large frame and build your gallery wall around, bearing in mind how much wall space you have to play with. If you’re not too sure of one composition, take a photo with your phone and make another one. Leave it for the night and go back to it the day after with a fresh eye. Once you’re happy with your composition, cut some kraft paper to the size of all your framed pictures and position them on the wall with masking tape. Think about surrounding pieces of furniture. Is it high enough? Does it fill in your wall nicely? Does it look balanced? The beauty of this kraft mock up is that it will really help to place the nail in the perfect spot. You can then hammer it directly and tear the kraft paper away afterwards. Please check what your wall is made of to make sure the picture frame doesn’t fall off at a later stage. For instance, if you have a plaster wall, you may need to use plastic plugs and a drill. This is the best part where your composition with your favourite photos and posters come together! Hang everything, step back et voilà! Disclaimer: This post is sponsored by Desenio. Thank you for supporting the sponsors that make the BODIE and FOU blog possible. Great post! We just moved into a new flat and looking to add some prints. Love your blog! Thank you! Thank you for sharing. This space is very nice and modern. I’d love to get such a space.